Friday September 25th 1903 with Wills help I cleaned the little room and the north bed-room up stairs. It was a fine day to take up carpets. I did the regular work. Mollie went home tonight. a warm wind today. 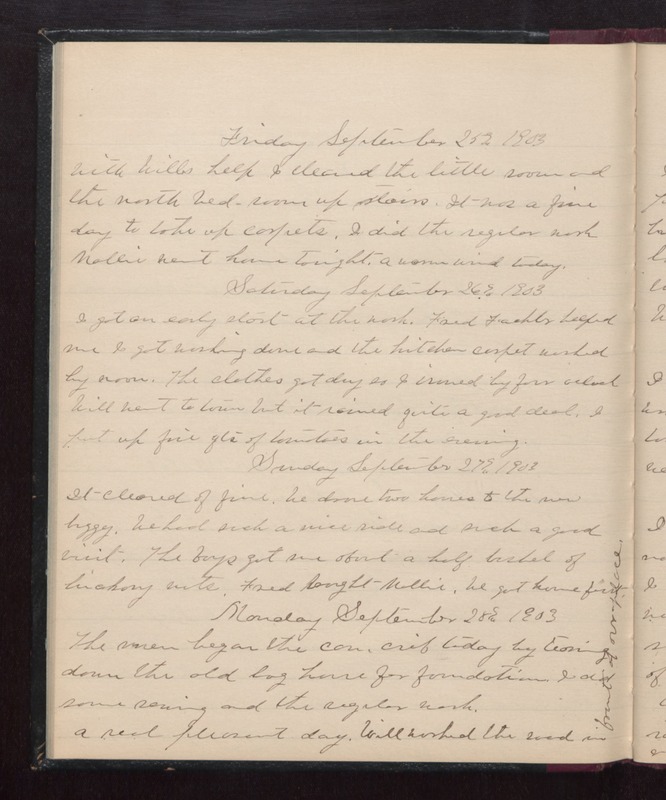 Saturday September 26th 1903 I got an early start at the work. Fred Fachler helped me I got washing done and the kitchen carpet washed by noon. The clothes got dry so I ironed by four oclock Will went to town ut it rained quite a good deal. I put up five qts of tomatoes in the evening. Sunday September 27th 1903 It cleared of fine. We drove two hours to the new buggy. We had such a nice ride and such a good visit. The boys got me about a half bushel of hickory nuts. Fred brought Mollie. We got home first. Monday September 28th 1903 The men began the corn crib today by tearing down the old hog house for foundation. I did some sewing and the regular work. A real pleasant day. Will worked the road in front of our place.